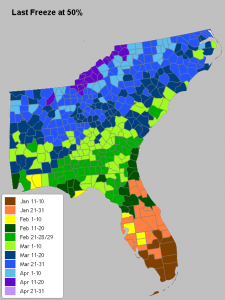 Climate and Agriculture in the Southeast | Have we seen the last frost of the winter? Have we seen the last frost of the winter? As you know, the last few weeks have been much MUCH above normal in temperature across the Southeast, with temperatures in many places setting daily records for maximum and high minimum temperatures and quite a few stations expected to set all-time February daily and monthly records. One of the results of this warm weather is that flowers and flowering trees are blooming profusely, as much as two weeks ahead of normal (in some cases, more like 3-4 weeks ahead of normal–I saw some dogwood blooms today on my way home from church). This is similar to last year, when the season was running about 20 days ahead of normal due to the warm winter we had then. Many people have asked me if these warm conditions will continue or if we will see more frost and freezing weather this spring. If you’re interested in the answer without all of the details, please head to the bottom of this blog post. The next few paragraphs will explain what I used to determine my answer. Statistically, we can find frost data from several places. Agroclimate.org has frost climatology maps at http://agroclimate.org/tools/freeze-risk-probabilities/. These three maps show the 10%, 50% and 90% frost dates for spring and fall for 32 F if you pick Last Freeze Dates under “Risk of Freeze” on the left menu. The 10% shows that in 1 out of 10 years, the last freeze of the year will occur on or after this date, the 50% shows the average date of last frost, and 90% shows the date for which 9 out of 10 years will have a final spring frost later than that date. For Athens GA, the 10% range is April 1-10, the 50% range is March 11-20, and the 90% range is March 1-10. In Athens, the last time we got down to 32 F was on February 9, which would be well outside the 90% range. Using statistics alone, then, it would seem unlikely that we have seen our last frost. However, keep in mind that temperatures in recent years have been warmer than the long-term average, so these statistics might not be as representative of the current climate as you might like. The Southeast Regional Climate Center has more detailed information in the form of historical graphs and tabular output. You can get to it by going to http://www.sercc.com/climateinfo/historical/historical_ga.html and picking your station from the map (if you are not in Georgia, then replace the “ga” in the link by the two-letter identifier for your Southeastern state). Once you pick your station, go to the left menu and look for Spring ‘Freeze’ probabilities. That will bring you to a graph (or you can get tabular data below) which shows the same information, except that it is more date-specific and also shows different temperature thresholds. The tables gives the three dates as April 11, March 25 and March 11, respectively. Again, statistics would say that it is unlikely we have seen our last frost. The earliest date on record for a spring frost is February 9, so if this year does not see another frost, it would tie for the earliest spring frost date at the Athens airport station. Again, keep in mind that recent winters have been warmer than the years on which these statistics are based, which could mean they not as accurate as you would like. To get a look at the predicted conditions, I often use the GFS forecast model which is you can look at using https://www.tropicaltidbits.com/analysis/models/. You have to keep in mind that the farther ahead in time the model is predicting, the less reliable it is, so forecasts at the far end of the prediction window are not highly believable. However, they can give you a first glance at general trends in what the weather is expected to do over the next few weeks. You can find the 2-m Temperature variable under Thermodynamics beneath the map. As you click forward in time, you can see the predicted temperature at 2 meters (about 6 feet) for several time periods per day. The times are in Greenwich Mean Time (which meteorologists call Z), so morning here in the southeast would be around 12Z (7 AM Local Standard Time), which is when the temperature is usually lowest. If the full number of days is not yet available, it means the model has not completed its latest run and you should click on the white box on top right to pick an earlier model run with a complete set of data. Keep in mind that temperatures closer to the ground are likely to be colder, especially in parts of your fields that experience cold pockets from cold air drainage into low-lying areas. The latest model I’ve looked at shows that there are three separate outbreaks of cold air which could affect northern Georgia in the period from March 3 to March 12, including some where temperatures in the northernmost counties get well below freezing at 2 meters. Central and South Georgia are less likely to see these cold temperatures, although local frost pockets might still be susceptible. For the longer range, at the same Tropical Tidbits site, look under Climate on the top menu for the CFS weekly forecast. This will show week by week anomalies for the next six weeks (under Thermodynamics). This shows that Week 2 from March 4 to 11 is the only week out of the next six with colder than normal temperatures expected. I take this to mean that once we get past about March 12, we are not likely to see more frost this year, since seasonal temperatures are climbing as the sun gets higher in the sky. –>Bottom line, considering the current forecasts, I think we may have already seen the last widespread frost for the lower 2/3 of Georgia this year, although some frost-prone areas could still see freezes in the next couple of weeks. The northern third of Georgia, especially in the most northern and mountainous counties, are likely to see at least one and perhaps several mornings with frosty conditions in the time period from March 3 to March 12 before things get warmer again. I will be watching the forecasts closely to see if they change towards colder conditions and will post updated outlooks on this blog if I see signs of special concern. Posted in Climate outlooks, Fruit, Sources of weather and climate data, Tools for climate and agriculture. Bookmark the permalink. The "Climate and Agriculture in the Southeast" blog is provided by the UGA Crop and Soil Sciences Department as a service to Extension agents and agricultural producers across the Southeast US. Come here to find out information about the impacts of weather and climate on agriculture across Georgia and beyond.